I had the pleasure of working out of Wellington’s BizDojo about four years ago on a project to collate just who were the local Wellington companies using R&D in their businesses. If I had to give a description then, I’d have said it was a cool co-working space, and it would be interesting to see how it evolves. Well, heck has it grown up. Not only has the Wellington site on Vivian St moved upstairs and now has 90 or so fulltime residents in a swish ‘boy, I wished I worked there’ space, there’s another right next-door 70 x 50m2 space that is being developed to cater for companies of 1 – 12 people. BizDojo’s main space sees the company started by Nick Shewring and Jonah Merchant, looking like it means business and fun at the same time. This is in no small way through the joint venture/working showroom arrangement with ‘Haworth by Europlan’ furniture that populates the office. There’s height adjustable (standing) desks, moveable tables and desks, quiet (soundproofed) cubicles and private meeting spaces dotted around the light and airy space. A desk in this space costs $300/month, including the furniture, with all the wifi you can eat. It is little wonder that some government workers/departments who use the space for one-off projects find their own employees wanting to permanently locate there. Wellington isn’t the only location that is seeing the BizDojo model of co-workingness gelling with entrepreneurs and others who (like me) dislike working alone. New Zealand’s now has 280 BizDojo (ers, ees, whatever the collective noun is) spread across its Christchurch, Wellington and Auckland sites. 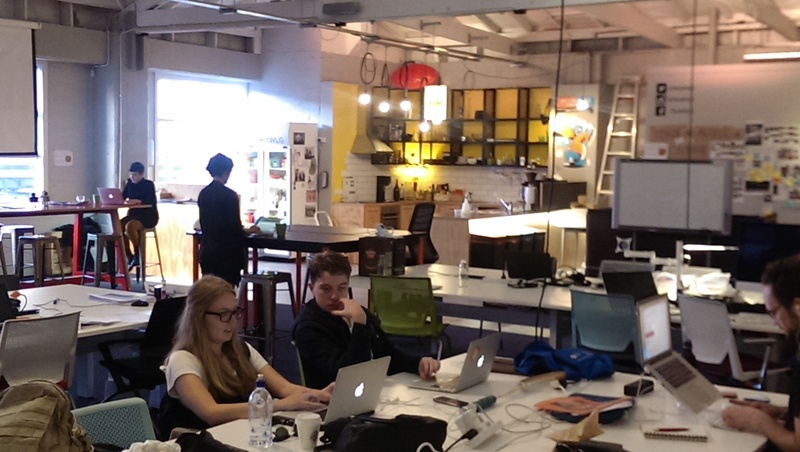 But this co-working space is doing more than creating interconnections between individuals’ networks, skills and ideas. As Shewring commented, there’s plenty of other co-working spaces tried to get off the ground in New Zealand (and around the rest of the world). Shewring makes the observation that many of those other plays have been ‘rental’ arrangements…bums on seats. In comparison (though naturally it has to make a profit), BizDojo’s success is very much based on its members’ success. When they do well, grow, take on more people, BizDojo does well. Of course the ultimate success is when the new company leaves its BizDojo home, and so far it can claim ??? have moved on, while staying close! Shewring and Merchant believe they’re got the model humming along in the right way to replicate their system in other countries. They’re now busy, very busy, looking to set up in other countries such as Thailand. From what they’ve seen and observed, the collaborative networking (and fun) co-working spaces they’ve refined here, will work overseas. Indeed, it can pretty easily be argued that this type of ‘office’ will increasingly become the norm as work develops. Whether it is replicable remains to be seen. But, if you don’t try you’ll never know – and given that one of the objectives of the collective BizDojos is to network across sites, you wouldn’t put it past being an under-the-radar conduit for Kiwi businesses looking to enter new markets…just like BizDojo itself.